Note: In the next printing of Growing Prosperity, this preface will replace the one that is currently found in the book. 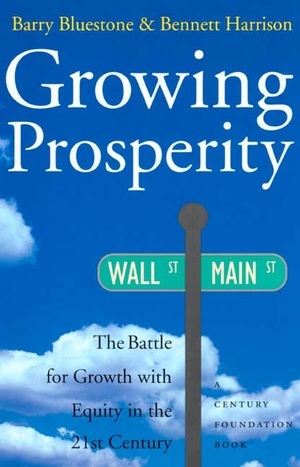 After the publication of the first edition of Growing Prosperity in January 2000, the American economy soared to even greater heights than the original volume predicted. With surging economic growth pushing unemployment down to four percent, earnings and income inequality continued to wane. Then, in early 2001, the economy began to slow dramatically. The first hint of the downturn came just months before the new year as one dot.com company after another went belly-up. Corporate profit reports began to show red ink for the first time in years, spooking the stock market. NASDAQ, where the hot new technology stocks were housed, saw its price index plummet, eerily reminiscent of the Dow Jones Industrial Average in 1929. Consumer confidence began to tumble, leading to the fear that families would soon reduce their spending in anticipation of bad times. Such a reduction in household consumption could easily become a self-fulfilling prophecy. For the first time in nearly a decade, the word "recession" was muttered. The slowdown in the economy was not totally unexpected. Beginning in late 1999, the Federal Reserve Board piled on seven quarter-point interest rate hikes in a row. It did this ostensibly to counteract the stock market's "irrational exuberance" and to bring the soaring economy to a soft landing rather than a hard crash. Clearly, by early 2001, Alan Greenspan and the Board recognized their early efforts amounted to overkill with a lag. An emergency cut of one half point in short-term interest rates in January was followed within weeks with another half point cut. But everyone knew that just as the original interest rate hikes took months to take effect, the rate cuts would entail a long lag too. By February, dozens of major companies were announcing layoffs and the official unemployment rate was on the rise. Now the concern was whether we were in for a brief period of economic stagnation or a full-blown recession. The optimists hoped we would be growing again by the second half of 2001. The pessimists hinted that the late 1990s economic boom was a joyful, but short-lived, aberration. A return to anemic growth with rising unemployment and increased inequality would be almost inevitable for years to come. Is the boom over? Or does the economy have the wherewithal to overcome the current downturn and resume three percent or better annual economic growth into the foreseeable future? The answer to these questions, we believe, lies in whether we have the wisdom to understand what brought us newfound prosperity in the first place and the political savvy to implement appropriate economic policy in light of that knowledge. Without a better idea of what has been responsible for the economic resurgence we have enjoyed, there is little hope that we will do the right things to keep the economic engine humming and assure the gains are equitably shared. The recent U.S. presidential campaign, not to mention the bizarre culmination to the national election, did not help very much in this regard. Despite Ralph Nader's contention that George W. Bush and Al Gore resembled tweedledee and tweedledum, the two candidates expressed very different views on how to promote economic prosperity. Following in the tradition of Ronald Reagan's supply-side nostrums, President Bush continues to champion a huge tax cut (admittedly benefiting the rich the most) to keep America growing. Tax cuts would presumably stimulate both spending and saving, spurring the economy in the short run and boosting private investment over the long term. For his part, Mr. Gore claimed, to the day he conceded defeat, that he would make America "even better" by saving the lion's share of the projected federal government surplus in order to quickly eliminate the nation's entire multi-trillion dollar privately-held federal debt. Debt reduction, he affirmed, would help sustain American prosperity by keeping interest rates low and inflation at bay, boosting private investment. The problem, as this book attempts to explain, is that neither candidate provided much insight into the real sources of economic growth. Indeed, both the tax policy that Bush promised to implement and Gore's debt retirement pledge could do more to sabotage long-term prosperity than promote it. Since both candidates shared a fundamental misconception of why the American economy began to grow again in the mid-1990s, both failed to offer an appropriate public policy to sustain this growth. This volume tries to explain why America experienced such a profound and exhilarating economic renaissance in the 1990s and what it will take to maintain this new found prosperity. It challenges the conventional wisdom that President Clinton's commitment to deficit reduction and the Fed's obsession with inflation containment were the keys to economic revival. The book reviews a great deal of growth theory--emanating from economists who work in the neo-classical tradition as well as from those who are their critics--so that students and others can judge what factors promote economic growth in an information age. It also lays out a set of policies aimed at promoting growth and greater economic equity based on this exploration of theory. The paperback version is virtually identical to the original book with one exception. Since the original appeared, new data have been issued by the government on productivity and growth. Using more sophisticated techniques, statistics for past years have been revised and we now have more recent data documenting the nation's economic progress. As a result, the tables and charts in Chapters 2 and 3 have been updated. If anything, the new and revised statistics make the argument for growth presented in this book even stronger. One last note. Soon after this book first appeared in hardcover, I was invited to a number of high level conferences in Europe and in Japan to explain the ideas Ben and I had captured in this latest book of ours. With their nations' unemployment rates in double-digits, German and Italian audiences wanted to know the secret of America's economic success. Mired in recession, the Japanese were even more curious. Almost universally, those in the audience assumed that balancing the federal budget, reining in inflation, and increasing labor market "flexibility" through weaker unions, freer international trade, and welfare reform were the sine qua non of America's economic renaissance. They were therefore more than a little surprised when I disabused them of this idea. After all, they had been told this tale in virtually every business publication they had read in English or in their own language. When I told them the roots of the current prosperity could be traced to public investment policies of the 1960s and 1970s, they were more than mildly interested. To challenge the conventional wisdom by identifying various streams of growth theory is the purpose of this volume as it was in those lectures. If this book helps to broaden the discourse in the U.S. and abroad about the sources of growth and appropriate public policy, we will know that this effort was ultimately a success.